It has been a long time. We’ve been around, just not posting. Now it is time to give you a taste of what we have been working on. You have been busy combing through our archives. Thanks! It’s good to see our material is not going to waste. But there are new battles to add to the old; we must continue the fight for justice. Keep tuned for some new content. Scroll down for the full schedule of panels and speakers. In honour of the Law Union’s 40th anniversary, join other conference-goers on the evening of Friday, March 15th, for a celebration with live music, drinks, reflections, and awards. This event will be held at the Tranzac, 292 Brunswick Avenue, Toronto, from 7:30 pm onwards. All are welcome! Panels full of Women: 40 Years Later, Has Anything Changed? Delia Opekokew is a lawyer and a deputy Chief Adjudicator for the Independent Assessment Process. From the Canoe Lake First Nation in Saskatchewan, she was the first First Nations lawyer ever admitted to the bar association in Ontario and in Saskatchewan, as well as the first woman ever to run for the leadership of the Assembly of First Nations. Childcare will be provided – please email us in advance at lawunionofontario@gmail.com with the number and ages of the children who will be attending. Questions? 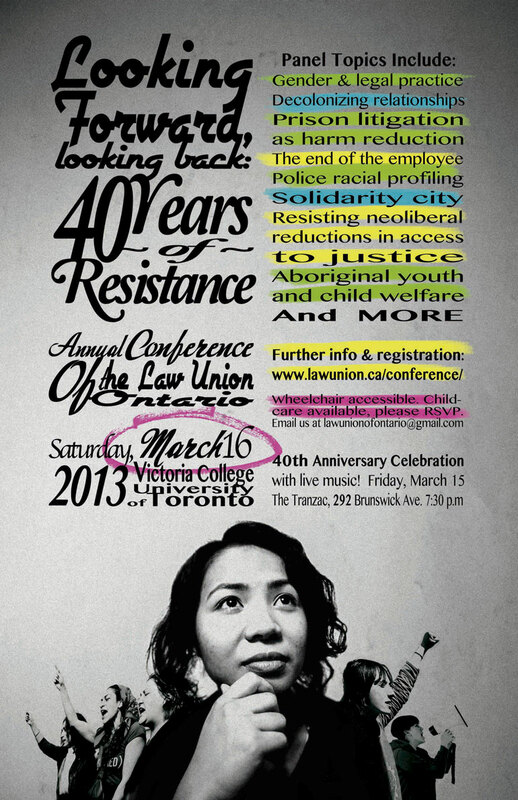 Email us at lawunionofontario@gmail.com, and include “conference” in the subject heading. Host Garrett Zehr chairs an array of reflections on the subject of discrimination in Canada, specifically looking at race and gender. First, contributor Alyssa Clutterbuck presents a segment on the nature of discrimination. Sonia Lawrence, Professor at Osgoode law school, discusses the subject – “Is all discrimination alike?” Lawrence is the Director at the Institute for Feminist Legal Studies at Osgoode. Twitter – @osgoodeifls. This pithy presentation is worth listening to several times over. Second, LegalEase remembers R v. RDS at 15 years – a seminal decision on race and and the judicial system. R. v. S. (R.D. ), 1997 CanLII 324 (SCC),  3 SCR 484, In the case, the Supreme Court of Canada ruminates over the decision of Nova Scotia judge Sparks to take judicial notice of the systemic racism within the justice system. A finding of reasonable apprehension of bias against Sparks was overturned at the Supreme Court. Contributor Alyssa Clutterbuck sets up the piece, explaining why the case remains a chilling representation of the manner in which the Canadian legal system discusses race. Next, Legalease contributor Lillian Boctor interviews Dr. Esmeralda Thornhill James Robinson Chair at Dalhousie University and visiting scholar at McGill. Finally, LegalEase revisits an earlier story presenting a study by Natai Shelson on the gendered experience of law school. You can find part of Shelson’s study at p 4 of the this edition of the Quid Novi, February 2011. LegalEase on 90.3 FM is a radio program broadcast every second Friday of the month at 11am EST from Montreal, Quebec. Originally founded by the McGill Legal Information Clinic in 1989, LegalEase is now run by a collective of progressive of law students from McGill University. Our weekly radio show deals with legal topics of interest to the community, with the intention of making the law both accessible and engaging. Tune into our show, follow us on Twitter @LegalEaseCkut, email legalease[at]ckut.ca or check our podcast library for past programming. Check out the Saturday, February 9, 2013, edition of the CBC Program “Under the Influence”. Great analysis of Court cases regarding the use of songs in commercials and for commercial purposes. Very fun episode. France. 1927. Murder. Genocide. Justice. The Trial of Sholom Schwartzbard. A radical yiddish anarchist is a lonely parisian. Years earlier his entire family had been murdered by Ukrainian nationalists during pogroms, along with thousands of other Ukrainian Jews. In Schwartzbard’s mind, blame rested on the shoulders of the movement’s leader, Simon Petlura. So Schwartzbard killed Petlura on the streets of Paris, using a pistol. Here is Time magazine’s rendering of the trial from 1927. Court. In the dim court of Assizes, in Paris, during the past fortnight, more than 400 spectators saw the beginning and the end of one of the most gruesome, bloodcurdling, impassioned trials ever to be held in that vaulted hall of justice. Quivering flappers sat to gasp with astonishment beside white & black bearded Jews who exchanged shocked glances with flat-faced Slavic Ukrainians under the noses of red & black-robed judges. Within and without the courtroom was a triple guard of gendarmes to prevent disorder. Culprit. 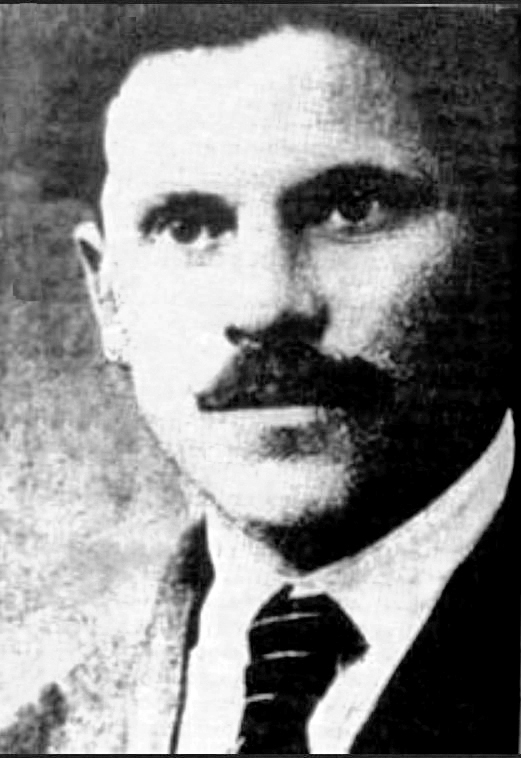 The accused man, who not only admitted committing the crime but even boasted of it, was a young Jewish Ukrainian, now a naturalized Frenchman, Sholem (Samuel) Schwartzbard, a watchmaker by profession. Short, ugly, he yet commanded the attention of the whole court, for he told his story, not as do many prisoners, shamefaced and haltingly, forced to reveal their crimes and motives by harassing lawyers—no, Watchmaker Schwartzbard openly confessed with gleaming eyes and hysterical mien, his body trembling with passion, how he slew “General” Simon Petlura to avenge the deaths of thousands of Jews slain in pogroms, which he charged “General” Petlura instigated. Victim. Simon Petlura, in the opinion of many, was an adventurer. The son of a Russian cabman, he is said to have been active in plotting against the Tsar. In 1918 he entered Kiev, capital of the Ukraine, with the Austrian and German armies, under whose auspices he took the lead in trying to separate that province from the rest of Russia. He not only promoted himself a general but also declared himself ruler of the Ukraine. He failed and was obliged to flee. Two years later he reappeared, this time under the Poles, becoming president of a short-lived Ukrainian republic. He played off the Poles against the Bolsheviki and the Bolsheviki against the Poles and, eventually, again fell from power, this time to flee to France, where he lived in Paris until slain there by M. Schwartzbard. Under his regime, it is charged, more than 50,000 Jews were killed. Lawyers. Henri Torres, chief counsel for the defense, florid, bloated, dynamic, put his histrionic abilities to the test when, leaping past his colleagues into the middle of the courtroom, he brandished a revolver, produced from under his voluminous black gown. Shrieks of terror mingled with gasps met this display. Flappers sat with blanched faces; bewhiskered Hebrews rocked back and forth with supressed excitement; Ukrainians, more pallid than ever, glanced nervously through their narrow eyes. Maitre Torres, aiming at a chair, pulled the trigger—there was a dull click, followed by sighs of relief. He was attempting to prove that M. Schwartzbard could not have shot Simon Petlura as he lay , prone on the ground. Cesare Campinchi, flaccid, verbose, excitable, chief prosecution lawyer representing the Petlura family, particularly Widow Petlura, who was in court, proved himself the equal of Maitre Torres in oratorical and theatrical ability. Accused of suppressing evidence by M. Torres, he roared: “Don’t accuse me of suppressing evidence, Torres!”* “Don’t force me to place in evidence your personal pedigree!” yelled Torres. And thus they continued. “Here’s my chance, I thought. ‘Are you Petlura?’ I asked him. He did not answer, simply lifting his heavy cane. I knew it was he. “I shot him five times. I shot him like a soldier who knows how to shoot, and I shot straight so as not to hit any innocent passerby. At the fifth shot he fell. He didn’t say a word. There were only cries and convulsions. “Then you admit premeditation?” asked the judge. “Yes, yes!” replied M. Schwartzbard, his face lit with fanatical exultation. Trial. The case opened with M. Schwartzbard telling the court in a high pitched voice and halting French, his beady eyes gleaming, his face suffused with joy, how he had tracked Petlura down. With a photograph of his intended victim in his pocket and a loaded pistol in another, he was wont to roam the street peering into the faces of passers-by to see if they were Petlura. All this, he said, he did to avenge the assassinations of his coreligionists. Finally, he found and killed him. “No, no, no, he lies!” chorused a dozen people in the court in as many languages. “They cut them down with naked blades,” screamed M. Schwartzbard. “I accuse that man of being an agent of Moscow. I swear it a thousand times!” roared another witness for the prosecution, pointing an accusatory forefinger at M. Schwartzbard. “Prove it! Prove it, then!” flung back the defiant Schwartzbard, dropping limp, into his seat. A squat Slav, called by the prosecution, who described himself as an “historian, a man of letters and at present an assistant to a stone-mason,” gave evidence in Petlura’s philo-Semiticism, denying with a grief-contorted face that the “General” had ever killed Jews or caused them to be massacred. “Yes! Yes! He massacred them!” shouted Schwartzbard, unnerved. Verdict. Amid tense excitement, after an absence of 35 minutes, the jury returned a verdict for the young, pale faced Jew’s acquittal. Frenzied cheering greeted the decision. M. Schwartzbard, calm, kissed his lawyer, Maitre Henri Torres. “Vive la France!” shouted somebody. “Vive la France!” echoed some 500 voices. In addition to setting M. Schwartzbard free, the verdict ordered the Petlura family, represented by Maitre Caesare Campinchi, to pay the costs of the trial, but awarded damages of one franc each to Mme. Petlura, widow of the slain “General,” and to M. Petlura, his brother. The outcome of the trial, which gripped all Europe, was regarded by the Jews as establishing proof of the horrors perpetrated against their co-religionists in the Ukraine under the dictatorship of Simon Petlura; radical opinion rejoiced, but the conservatives saw justice flouted and the decorum of the French courts immeasurably impaired. Schwartzbard, free, went into hiding, fearing assassination at the hands of anti-Semites. *It is customary in French courts to employ the title “maitre,” a term of respect. The European Court of Human Rights (constituted under the Council of Europe) released a decision on January 29, 2013 concerning discrimination against Roma citizens in Hungary. The case is HORVÁTH AND KISS v. HUNGARY 11146/11 . The two complainants had been been improperly placed in special education schools designed for mentally disabled / special needs students on the basis of their ethnic origin. The European Roma Rights Centre were active in representing the complainants. The ruling falls at a time when Canada is putting up major barriers to Roma migration. Despite voluminous indications of differential treatment and xenophobia, the Canadian Government, and in particular, Minister of Immigration et al, Jason Kenney has been making strides in depicting Hungary as a safe democratic country. In particular, and in a bizarre move, Kenney has been setting up billboards in Hungary, telling Roma people that if they come to Canada, they will be deported. Here is the sign below. We hope that Canada will take note of the recent Human Rights decision from Europe. The recent demonization of the Roma community has come on the heels of xenophobic remarks made by long-time Conservative Party activist Ezra Levant on Sun TV. Canada’s Federal Court has recently issued two decisions finding a lack of consideration towards workers’ childare issues discrimination on the basis of ‘family status’. Both decisions were penned by The Honourable Leonard S. Mandamin. First, on January 31, 2013, the Federal Court released Canada (Attorney General) v. Johnstone, 2013 FC 113 (CanLII). Here, Ms. Fiona Johnstone complains of human rights discrimination at work due to family status. Johnstone argued that her employer, the Canadian Border Services Agency, “engaged in a discriminatory employment practice with respect to family status, specifically, in relation to her parental childcare obligations.” Johnstone had been working rotating shifts and requested full-time, fixed day shifts to accommodate childcare for her kids. The Employer’s policy prohibited fixed day shifts. Johnstone was therefore ineligible for benefits available to full-time employees. Simply stated, any significant interference with a substantial parental obligation is serious. Parental obligations to the child may be met in a number of different ways. It is when an employment rule or condition interferes with an employee’s ability to meet a substantial parental obligation in any realistic way that the case for prima faciediscrimination based on family status is made out. In Amselem the Supreme Court of Canada ruled that a person’s freedom of religion is interfered with where the person demonstrates that he or she has a sincere religious belief and a third party interfered, in a manner that is non-trivial or not insubstantial, with that person’s ability to act in accordance with the belief. The phrase “a substantial parental duty or obligation”equates with and establishes the same threshold as a sincere religious belief. Amselem. In my view, the serious interference test as proposed by the Applicant is not an appropriate test for discrimination on the ground of family status. It creates a higher threshold to establish a prima faciecase on the ground of family status as compared to other grounds. Rather, the question to be asked is whether the employment rule interferes with an employee’s ability to fulfill her substantial parental obligations in any realistic way. This decision is cited and further bolstered by a second decision on the same topic, released February 1, 2013. In Canadian National Railway v. Seeley, 2013 FC 117 (CanLII) , the Federal Court dismisses an appeal against finding of discrimination on the basis of family status. Denise Seeley was employed by CN as a freight train conductor. She was on lay-off and was recalled to report to a temporary work assignment to cover a major shortage in Vancouver, British Columbia. She advised she could not report to Vancouver because of childcare issues, as Vancouver was far away from her home in Jasper, Alberta. CN gave Ms. Seeley additional time, however, she did not report for work; as a result, CN terminated her employment. c. does the employer conduct, practice or rule put the employee in the difficult position of choosing between her (or his) childcare duties or the workplace obligations?